the right and left calipers are installed symmetrically and therefore the removal procedure for one side is the same as that for the other side. 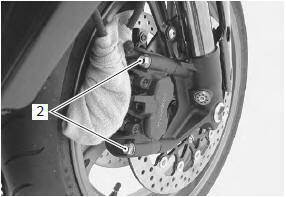 Remove the brake caliper by removing its mounting bolts (2). 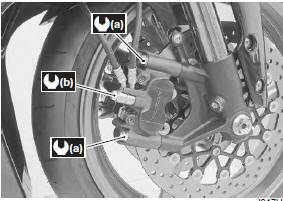 tighten each bolt to the specified torque. After setting the brake hose union to the stopper, tighten the union bolt to the specified torque.